Aim: A new generation of bone-anchored hearing aid, Baha® 4 Attract System has been introduced as a single-stage procedure with the magnet and abutment implanted on the skull with complete skin cover. Aim is to discuss the surgical and audiological outcome of this new device. Materials and Methods: This was a prospective study. There were 34 patients who fulfilled criteria for bone conduction hearing aid. Out of these patients, 27 were unwilling for the surgical procedure. Prior to the surgery, a trial with a soft band was carried out and seven patients were satisfied with the trial. 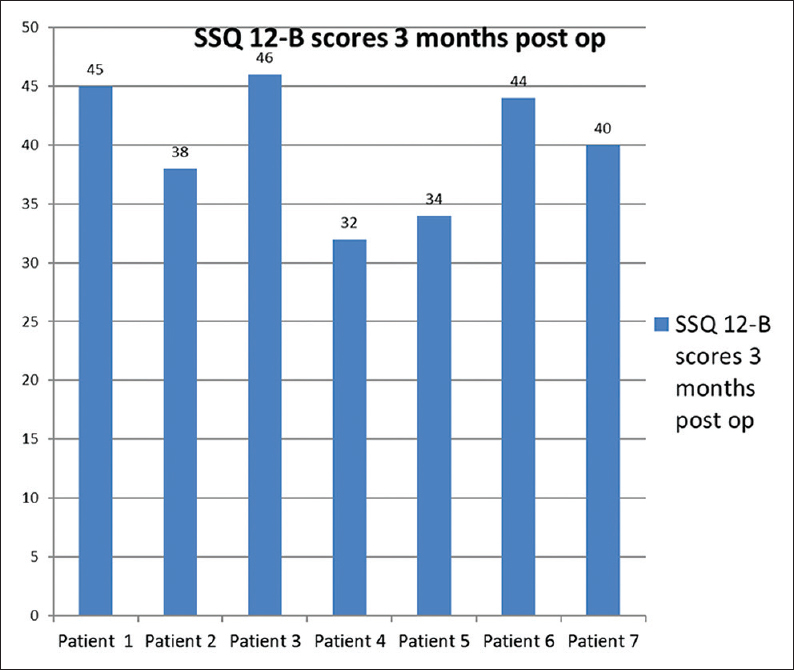 The outcomes were measured in the form of free-field pure-tone audiometry (PTA) after 3 months of surgery and quality of life gain using Speech, Spatial and Quality of hearing scale (SSQ-12B) questionnaire. Results: Outcomes in terms of gain in free-field PTA were good in all the seven patients. An average gain of 37.85 dB was observed. There was an improvement in quality of life as assessed by SSQ 12B questionnaire. An average score of 40.25 was achieved. Conclusion: Transcutaneous bone conduction aids are fast emerging as a viable alternate to traditional devices. These devices provide almost similar functional gain in hearing along with better cosmetic results, less complications, and minimal wound care. Bone conduction devices are used for assisting impaired hearing due to conductive hearing loss (HL) (CHL), mixed HL, or single-sided sensorineural HL (SNHL). There are numerous bone conduction devices available for use as illustrated in [Figure 1]. Direct-drive bone conduction aids transmit the vibration directly to the bone. The most common example is a conventional Baha® percutaneous system in which the abutment projects through the skin and the transducer is external [Figure 2]. The more recent Bonebridge™ system has transducer placed under the skin. 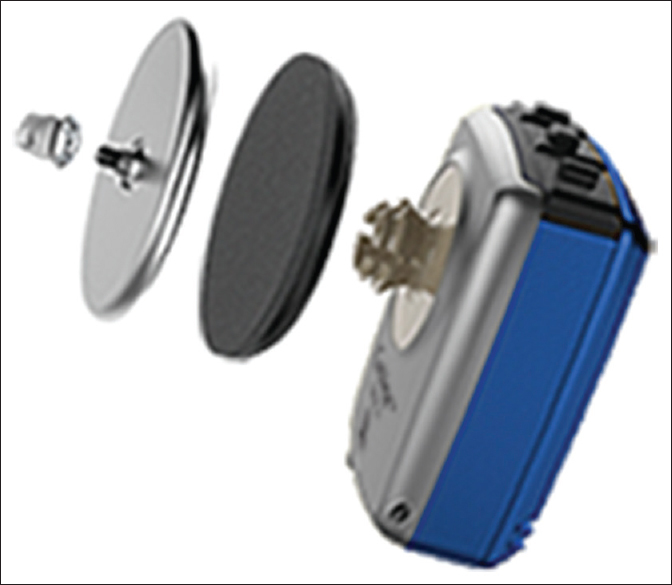 The more recent passive transcutaneous systems such as Baha Attract® and Sophono® have intact skin, and transducer is externally attached by magnet. There are obvious advantages of lack of soft-tissue complications, better esthetics, and less risk of failure of abutment. In this study, the selection criteria, surgical technique, audiological outcomes, and quality of life outcomes are discussed. We have performed transcutaneous bone-anchored hearing aid (BAHA) in seven patients of which four patients had single-sided deafness and three patients suffered from bilateral CHL. The objective of this study was to assess outcome of transcutaneous bone conduction system in patients with bilateral CHL and single-sided deafness. Unilateral SNHL with BC thresholds <30 dB HL (average of 500, 100, 2000, and 3000 Hz) in contralateral ear. Chronic conditions such as uncontrolled diabetes which could impair osseointegration. There were 34 patients who fulfilled criteria for bone conduction hearing aid. Out of these patients, 27 were unwilling for the surgical procedure. Prior to the surgery, a trial with a soft band was carried out and seven patients were satisfied with the trial. This study was a prospective case review of seven patients, details of which are summarized in [Table 1]. The pure-tone average for air conduction and BC was calculated for frequencies of 500, 1000, 2000, 3000, and 4000 Hz in the right and left ears separately and measured in dB preoperatively. Quality of life gain using Speech, Spatial and Qualities of hearing scale (SSQ 12-B) questionnaire. Baha® attract system is a newly developed transcutaneous bone conduction device by Cochlear Bone Anchored Solutions AB, Konstruktionsvägen 14, Mölnlycke, Sweden. The main components are (a) titanium implant, (b) implant magnet, (c) soft pad, and (d) sound processor [Figure 3]. The magnet and implant are internal components remaining under the skin which can be attached through invisible connection by magnet on the sound processor. The intervening soft pad distributes pressure evenly for wearing comfort. Flat periosteal surface is identified and the periosteum is elevated. Using the 3-mm spacer, drill the bone such that it should be perpendicular to the bony surface. Use the 2000 rpm setting and constantly irrigate using normal saline, if thick bone is encountered, the 4-mm spacer is used. Use the bone bed indicator to drill out (using diamond burr) excessive bone intervening the flat surface. Use 200 rpm setting and drill is designed in such a manner that when the counter sink is complete the drilling stops automatically. Do not irrigate during this process. Once the implant is inserted and adequately tightened the magnet is inserted by holding with the fingers and tightening using a unidirectional screw driver. The magnet has the marking of “UP” which should orient in superior direction with respect to patients head. More than 6 mm thickness may require thinning for proper attachment of magnet. Incision is closed in single layer with interrupted sutures. The surgical parameters and outcomes are depicted in [Table 2]. In patient 1, a modified anteriorly based flap was raised to avoid scar of previous pinna reconstruction surgery. In patient 2, soft-tissue reduction, due to thick flap, was carried out. This patient also required bone polishing using high-speed drill till bone bed indicator clearance was seen. 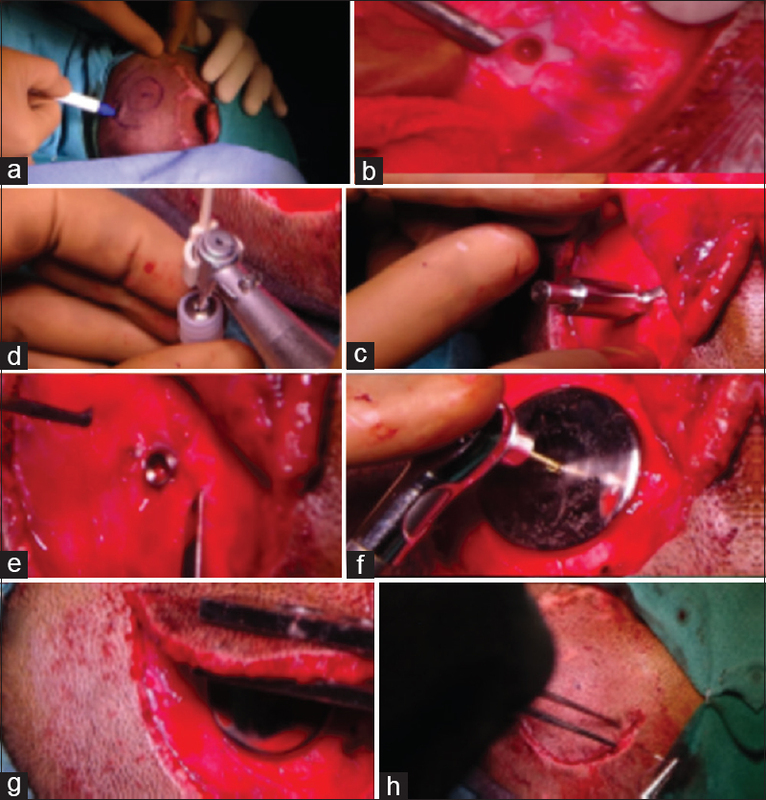 No intraoperative or postoperative complications were observed. Audiological parameters were measured 12 weeks postsurgery. The results are tabulated in [Table 3] and [Figure 5]. Patients 1, 3, and 6 had bilateral CHL, whereas patient 7 had unilateral conductive deafness and three patients had single-sided sensorineural deafness. Aided free-field PTA was done for the test ear (implanted side), and the contralateral ear was blocked using foam ear plug. SSQ-12 B questionnaire was utilized to ascertain benefit in ability to hear and listen in different situations. All patients benefitted from this procedure. Maximum improvement was observed in patient numbers 1, 3, and 6 who suffered from bilateral CHL. The scores are summarized in [Figure 6]. The aim of this study was to share the experience of newly introduced transcutaneous bone BAHA in terms of surgical outcomes, audiological outcomes, and patient satisfaction. This surgery was performed for the first time in Indian Armed Forces Hospital. Percutaneous bone-anchored devices are available since few decades. The indications for its use are bilateral, mixed, or CHL and single-sided deafness.,, These devices have abutment jutting through the skin to which the external transducer is attached. There are numerous studies which confirmed the benefit of using such devices., However, the acceptance and patient satisfaction remained low due to associated skin infections and complications, poor cosmesis, and difficulty in osseointegration. The complication rates in percutaneous technique have ranged from 8% to 59% and revision rates from 5% to 42%.,,,,, The transcutaneous devices like the BAHA® Attract system overcome these problems. This device is abutment free allowing the bone vibrations through intact skin by magnetic coupling between internal and external components. This in turn results in the elimination of skin complications and better cosmesis. 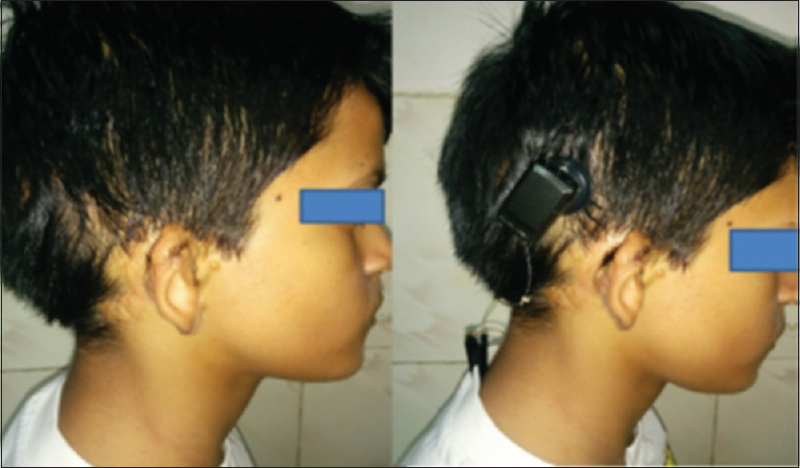 This is evident from [Figure 2] which depicts a child using old BAHA percutaneous system as compared with [Figure 7] showing a child using newer transcutaneous system. The osseointegration is easier allowing implantation in skull as thin as 3 mm as opposed to conventional percutaneous devices where at least 4 mm skull thickness is required. In our series of cases, we did not encounter any complications. All the patients were using the device for more than 8 h a day. There are a few studies which establish that satisfactory functional gains are achieved using transcutaneous devices., At present, two transcutaneous devices are commercially available namely Sophono® (Boulder, CO, USA) and Baha® (Cochlear Bone Anchored Solutions AB). We used the latter in seven patients. The audiological outcomes in terms of gain in free-field PTA were good in all the seven patients. An average gain of 37.85 dB was observed on the implanted side, which is comparable to gain achieved in other studies using traditional BAHA devices.,, In the future, we will consider conducting speech in noise test and localization studies, especially for single-sided deafness. There was an improvement in quality of life as assessed by SSQ 12B questionnaire developed by MRC Institute of hearing research, UK. An average score of 40.25 was achieved. Predictably, the maximum benefit was seen in patients with bilateral CHL. 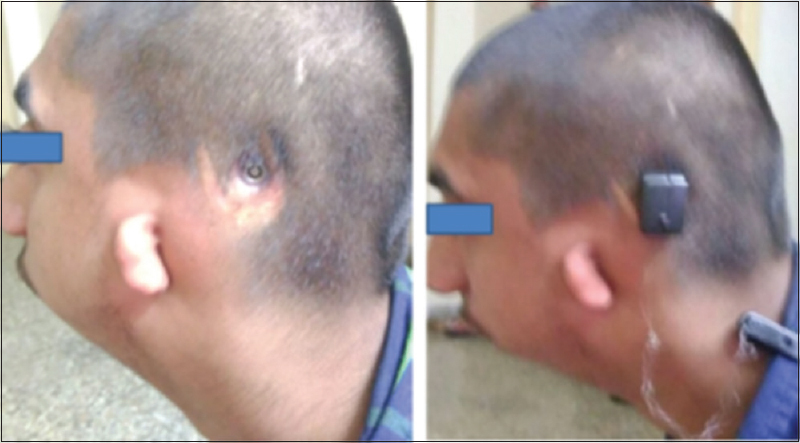 Patients with single-sided deafness were implanted with aim to improve localization. As they had normal hearing on the other side, the expected functional benefit of hearing was less. Transcutaneous bone conduction aids are fast emerging as a viable alternate to traditional devices. These devices provide almost similar functional gain in hearing along with better cosmetic results, less complications, and minimal wound care. Patient selection is of utmost importance to achieve good results. Reinfeldt S, Håkansson B, Taghavi H, Eeg-Olofsson M. New developments in bone-conduction hearing implants: A review. Med Devices (Auckl) 2015;8:79-93. Wazen J, Wycherly B, Daugherty J. Complications of bone-anchored hearing devices. In: Kompis M, Caversaccio MD, editor. Implantable Bone Conduction Hearing Aids. Basel: Karger Press; 2011. p. 63-72. Noble W, Jensen NS, Naylor G, Bhullar N, Akeroyd MA. A short form of the speech, spatial and qualities of hearing scale suitable for clinical use: The SSQ12. Int J Audiol 2013;52:409-12. Mudry A, Tjellström A. Historical background of bone conduction hearing devices and bone conduction hearing aids. Adv Otorhinolaryngol 2011;71:1-9. Dumper J, Hodgetts B, Liu R, Brandner N. Indications for bone-anchored hearing AIDS: A functional outcomes study. J Otolaryngol Head Neck Surg 2009;38:96-105. Martin TP, Lowther R, Cooper H, Holder RL, Irving RM, Reid AP, et al. The bone-anchored hearing aid in the rehabilitation of single-sided deafness: Experience with 58 patients. Clin Otolaryngol 2010;35:284-90. Shirazi MA, Marzo SJ, Leonetti JP. Perioperative complications with the bone-anchored hearing aid. Otolaryngol Head Neck Surg 2006;134:236-9. Wazen JJ, Young DL, Farrugia MC, Chandrasekhar SS, Ghossaini SN, Borik J, et al. Successes and complications of the baha system. Otol Neurotol 2008;29:1115-9. Yellon RF. Bone anchored hearing aid in children – Prevention of complications. Int J Pediatr Otorhinolaryngol 2007;71:823-6. Zeitoun H, De R, Thompson SD, Proops DW. Osseointegrated implants in the management of childhood ear abnormalities: With particular emphasis on complications. J Laryngol Otol 2002;116:87-91. Hobson JC, Roper AJ, Andrew R, Rothera MP, Hill P, Green KM, et al. Complications of bone-anchored hearing aid implantation. J Laryngol Otol 2010;124:132-6. Wallberg E, Granström G, Tjellström A, Stalfors J. Implant survival rate in bone-anchored hearing aid users: Long-term results. J Laryngol Otol 2011;125:1131-5. Hol MK, Nelissen RC, Agterberg MJ, Cremers CW, Snik AF. Comparison between a new implantable transcutaneous bone conductor and percutaneous bone-conduction hearing implant. Otol Neurotol 2013;34:1071-5. Sylvester DC, Gardner R, Reilly PG, Rankin K, Raine CH. 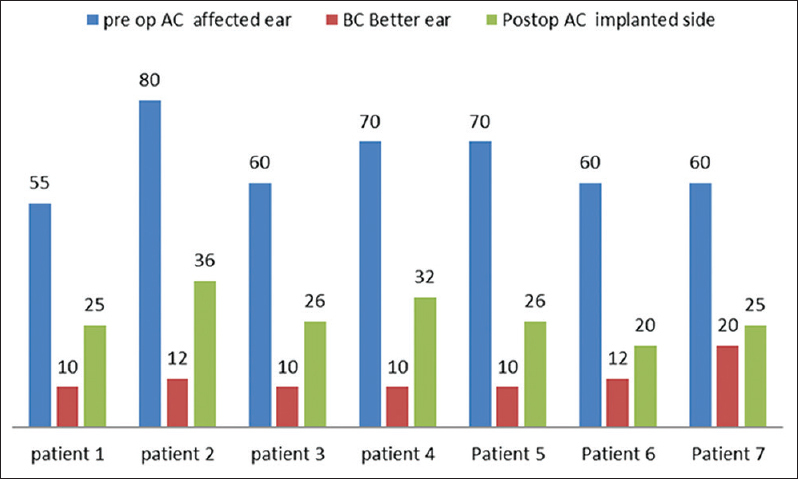 Audiologic and surgical outcomes of a novel, nonpercutaneous, bone conducting hearing implant. Otol Neurotol 2013;34:922-6. Gillett D, Fairley JW, Chandrashaker TS, Bean A, Gonzalez J. Bone-anchored hearing aids: Results of the first eight years of a programme in a district general hospital, assessed by the Glasgow benefit inventory. J Laryngol Otol 2006;120:537-42. McDermott AL, Williams J, Kuo M, Reid A, Proops D. The Birmingham pediatric bone-anchored hearing aid program: A 15-year experience. Otol Neurotol 2009;30:178-83.